Chicago Mayor-Elect Rahm Emanuel Celebrates Win : It's All Politics Emanuel avoided a runoff by winning 55 percent of the vote. The victory caps a campaign that included a failed legal bid to try to keep the former White House chief of staff off the ballot. 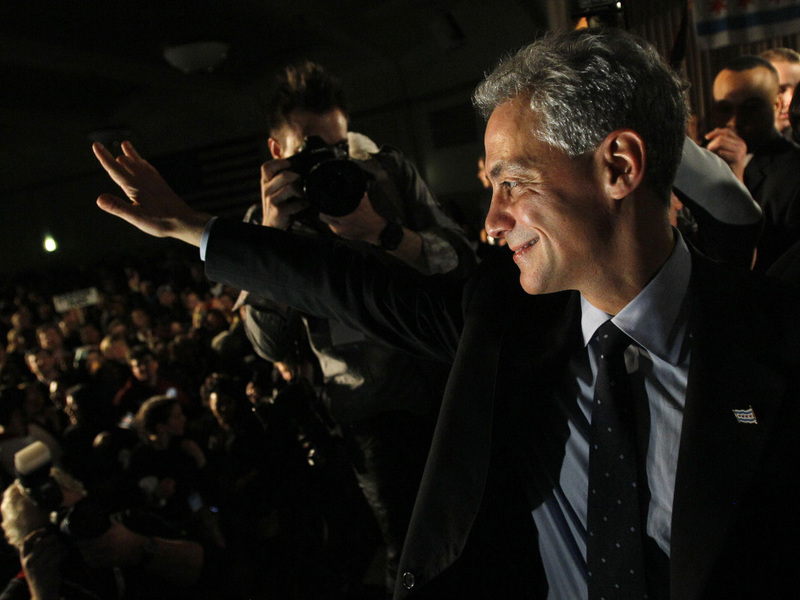 Chicago Mayor-elect Rahm Emanuel smiles at the crowd after winning the mayoral race Tuesday, Feb. 22, 2011. Ever since Rahm Emanuel won the legal right to be on the Chicago mayoral ballot, it was pretty much a given that he would win the plurality of votes when Election Day rolled around, which was Tuesday. So the question behind whatever suspense was left was, would Emanuel be able to win the 50 percent of the votes (plus one more vote for good measure) that would allow him to avoid a runoff? Once again, Emanuel proved it's probably a sucker bet to wager against him by winning 55 percent of the vote. His victory gives him a place in history, making him the Windy City's first Jewish mayor. Emanuel, President Obama's former White House chief of staff, had wanted to be the first Jewish speaker of the U.S. House. That didn't work out. But his new job running one of the world's most vital cities probably has more job security, as one of Emanuel's ex-bosses, Minority Leader Nancy Pelosi, can no doubt attest to. The man Emanuel will replace, Mayor Richard M. Daley, had the job for more than 21 years. Among the other Democrats Emanuel beat to become mayor was the candidate who came in second, Gery Chico, once the head of Chicago Public Schools. Chico had 24.1 percent of the vote. Meanwhile, Emanuel demolished perhaps the best-known candidate besides himself in the race, Carol Moseley Braun, the former U.S. senator and Clinton administration ambassador to New Zealand. She had about 8.9 percent of the vote. Braun was the consensus candidate of a group of Chicago's black leaders in a city whose African-American population is about 40 percent. Her relatively weak showing suggests that Emanuel can argue right off the bat that he is the mayor of all Chicago. In a city with a history of being racially polarized, that's definitely important. I want to extend my congratulations to Rahm Emanuel on a well-deserved victory tonight. As a Chicagoan and a friend, I couldn't be prouder. Rahm will be a terrific mayor for all the people of Chicago. Emanuel was helped significantly with the city's black voters by his tie to the president. There is still much pride in Chicago that it can claim to have produced the first black president of the U.S. The psychic value of that is hard to measure but no doubt vast. For Emanuel, who represented part of Chicago's North Side as a congressman, becoming mayor meant getting past a few significant hurdles. There was the psychological one for many Chicagoans of his seemingly parachuting in from Washington to claim the grand prize of Chicago politics for which there was a huge appetite since it had been off-limits for two decades. There was resentment and suspicion that he would be an extension of the Daley political legacy, seeing as he once worked for Daley and was close to the mayor as well as the mayor's brother, William Daley, the president's new chief of staff. And despite the pride Chicagoans have in Obama, there was the sentiment that Emanuel was coming to Chicago to be something like Obama's viceroy. Like the president didn't have enough on his hands dealing with the Iran and the House Republicans. All of these feelings coalesced and took shape in the legal challenge to Emanuel's eligibility, meant to keep him off Tuesday's ballot. That eventually failed but not before it actually helped Emanuel do something he needed to do. Emanuel returned to Chicago with a reputation as the intense wiry man with the raccoon eyes who made up for a missing middle finger through a use of profanity seldom seen in a public figure. But the residency challenge actually gave Emanuel a chance to publicly appear humble for hours on end, as his opponents' lawyers, then the public, took him on directly at public meetings of the election commission. If their goal was to get Emanuel angry so that he'd lose his self-control, they failed. Now the tough part starts. Emanuel confronts a major city which like New York, Los Angeles and many others has a budget crisis caused by not enough revenue to meet its expenses and an economy that's not getting enough lift. Still, even with all the difficulties, Chicago remains the archetypal American city with its people of virtually every ethnicity and nationality, its proud skyline, its smash-mouth politics, its lake as vast as an ocean and its rows of bungalows that stretch to the horizon. It's a city of nervous energy that just elected itself a mayor with that same quality. The Emanuel administration won't be boring, that's certain.